LiveWire Lake is a tiny back lake accessed from Mud Lake via a wide, 20 m ramp over which the boat is easily pulled. Less than a mile long and 200 yards wide, LiveWire Lake is nevertheless an interesting fishing lake and a great side trip on any outing to Mud Lake. Shoreline cover at LiveWire includes timber / logs, some weeds, and fast-breaking dropoffs are always worth some fishing time. 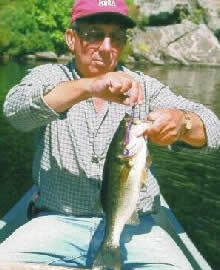 The lake has numbers of largemouth bass in the 1 to 2-pound range, but few trophies. It is rumoured that LiveWire is also home to schools of jumbo yellow perch. Because LiveWire is a “numbers” lake, it is a good site to experiment with various techniques and lures. Although plastic worms will produce the most fish here, spinnerbaits cast into the timber or along weedlines will also catch bass. Crankbaits and rattlebaits cast parallel to the rocky stretches of shoreline are very effective. Topwater approaches, near the timber or weedy areas, can produce good action, especially early or late in the day or on overcast or cloudy days.